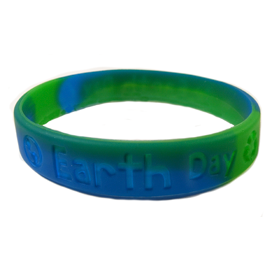 Highest quality recycled silicon wristbands. In-stock available to ship within 24 Hours! If this wristband is out of stock, delivery will be in two weeks. 100% silicon rubber. Standard Adult size: 8" circumference x 1/2" wide x 2mm thick. The May Claire Company Inc Everyone I came in contact with at BizPins was sooo professional and helpful. They helped me every step of the way!